We’ve all heard that regular white bread isn’t healthy for us. It’s high in carbohydrates which not only helps you gain weight but more importantly spikes up blood sugar. So what’s a better option to white bread? Enter Ezekiel bread. In this article, we check out the benefits of Ezekiel bread, and learn why it’s a much better, healthier option to white bread. Before we begin, we’ll have to explain what Ezekiel bread is. That’s because it isn’t the same as the normal bread, be it white or whole wheat, you find in the supermarket. Regular bread often contains wheat or whole wheat, and added sugars. Plus a few more additives. Unlike traditional bread, Ezekiel Bread is created using organic sprouted grains instead of refined wheat. These include sprouted millet, barley and spelt along with wheat. Lentils and soybeans are also used. In essence, instead of wheat or whole wheat, it is made with a variety of grains and legumes. It also has no added sugar. Compared to breads made with refined flour, Ezekiel bread offers a much more substantial nutrient profile. By allowing the primary ingredients to sprout, the amount of nutrients are increased. And, the number of harmful enzymes found in most grain seeds is also reduced. The majority of the ingredients used are organic and there is no added sugar (yes, worth mentioning a second time). But Ezekiel bread still contains gluten, albeit considerably less than your regular store bought bread. The makers of Ezekiel bread pride themselves on offering a preservative free product that has been naturally enhanced to provide a quality source of essential nutrients beyond what can be found in standard bread. 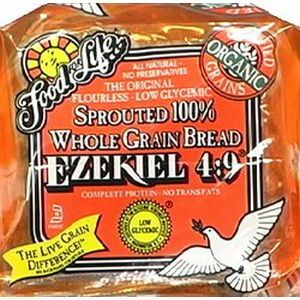 Ezekiel 4:9 Sprouted Grain Bread – this is the original version. 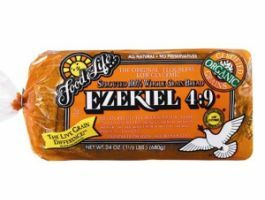 Ezekiel 4:9 Sesame Sprouted Grain Bread – these are rolled in organic unhulled sesame seeds. You’ll notice the sesame seeds on the crust of the bread. 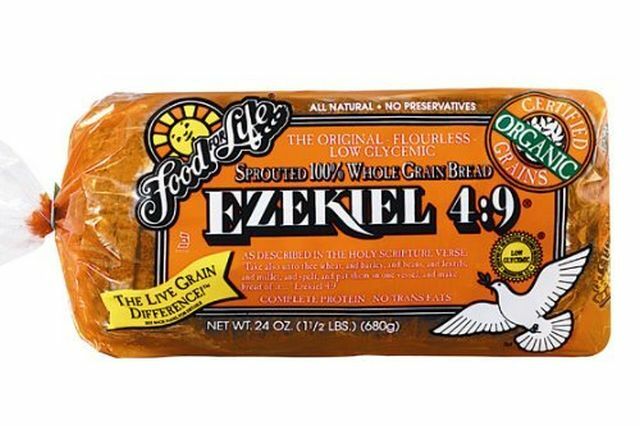 Ezekiel 4:9 Low Sodium Sprouted Grain Bread – is low sodium content. And no added salt is used in the ingredients. According to the nutrition label it has 0 mg of sodium. Here’s a quick list of Ezekiel bread’s benefits to our health. 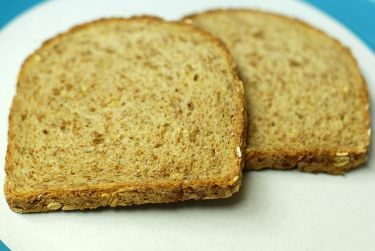 Each slice of Ezekiel bread is contains 80 calories and only 0.5 grams of fat. There’s no cholesterol either. You also get 4 grams of high quality protein that contain all 9 essential amino acids. Plus, there’s the 3 grams of fiber. Additionally, the brand’s sprouted whole grain bread is certified vegan and diabetic friendly. Sprouting is the process of soaking the grains in water. This allows them to germinate. And as a result, the germination process produces a number of biochemical reactions in the grain. Doing so increases the amount of healthy nutrients. Also, it reduces the anti-nutrients, which are harmful to the body, in the grains. Anti-nutrients can prevent or hinder the body’s ability to absorb nutrients like iron, calcium, magnesium and zinc. Sprouting is also one of the reasons the bread has such high quality protein content. Finally, sprouting cuts down the amount of gluten in grain. This reduces the gluten level content found in Ezekiel bread. We do reiterate however, that Ezekiel bread still does contain some gluten. And as such, it isn’t best suited for individuals who have gluten sensitivity or celiac disease. Ezekiel Bread offers a high quality source of essential amino acids. In fact it contains all 9 essential amino acids, yet being vegan. Amino acids function as the building blocks for all the tissue in our bodies. They are also the source material for the proteins needed to rebuild muscles after strenuous activity. In addition to helping maintain a healthy immune system, the amino acids found in Ezekiel bread may help to maintain a healthy central nervous system. White flour is the primary ingredient in most types of bread. Ezekiel Bread has completely removed white flour from its product. Traditional white flour has been processed and the parts of the grain kernel that help to slow digestion have been completely removed. The result is a product that no longer aids in promoting efficient nutrient uptake. Flour is quickly processed by the body and converted to sugar without adding much benefit to the digestive process. Refined flours have a much higher glycemic load when compared to grains that have been used whole. Getting rid of this component makes Ezekiel more nutritious and gives our body the ability to absorb nutrients better with less of the unwanted sugar spikes. Ezekiel Bread offers a substantial serving of whole grains. Whole grain products utilize the entire grain kernel and they retain higher levels of nutrients when compared to processed flour. Whole grains are rich in dietary fiber. Fiber aids in digestion by regulating metabolic processes and has been shown to increase nutrient uptake. Whole grains have also shown promise for those suffering from high cholesterol by helping to reduce levels of “bad” cholesterol and increasing low levels of “good” cholesterol. Lowered blood pressure has also been observed in people who consume whole grains daily. Complex carbohydrates are important for energy. The combination of grains and lentils break down slowly during digestion and provide a steady source of nutrient release. An additional benefit to their slow breakdown is the effect lentils have on blood-sugar levels. Lentils are renowned for their ability to stabilize glucose levels in the bloodstream. Lentils also provide a natural source of iron and help to prevent anemia. Though whole grains still contain gluten, Ezekiel Bread has lower gluten levels than traditional whole wheat brands. Anyone looking to cut back on gluten intake would benefit from consuming Ezekiel Bread. Gluten is difficult to digest and often causes digestive problems, even in people who are not gluten intolerant. Overall, Ezekiel bread in one of the healthiest alternatives to bread. It’s something we recommend due to its nutrient value and health benefits.